This is WWII according to Q.T. And what an exhilarating alternative ride it is! 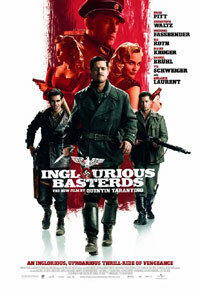 With his love of exploitation movies fused onto his psyche, Tarantino takes the viewer on a slow-burning excursion through Nazi occupied France with flashes of extreme violence and ample lashings of humour - his version of movies like The Dirty Dozen. 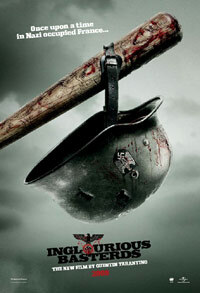 The Inglourious Basterds are a group of American soldiers with their sole purpose being to drive fear into the hearts of Nazi soldiers. They do this by scalping their victims and leaving the rare survivor with a not-so-friendly reminder. 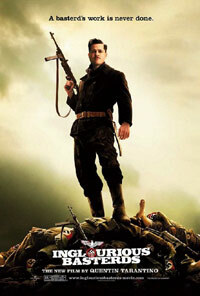 Their reign of terror leads towards their ultimate goal of getting Hitler, but there is another component to the story - the notorious Nazi Colonel Landa, in charge of fulfilling Hitler's plan (brilliantly played by Christoph Waltz, nabbing the Best Actor award at Cannes) massacred a Jewish family in rural France, but one of the girls, Shosanna, escaped. Years later she runs a cinema in Paris where a patriotic German movie (featuring a real German hero) is set to have its premier (at the behest of said hero, who happens to be smitten by her). These characters converge for one hell of a finalé of vengeance, justice and unbridled mayhem, rewriting history in the process. In true Tarantino fashion, protracted dialogue scenes are commonplace, but add to the film's appeal and in-depth character development. The characters are often beyond colourful, like that of Lt. Raine (Pitt), who is pretty much hilarious throughout with his old-school macho style, while fellow-director and Tarantino chum Eli Roth (Cabin Fever and Hostel) plays the baseball wielding Lt. Donowitz. Anyone who may have thought Tarantino to be out of his depth can rest assured, as this is one rip-roaring movie set to be the year's favourite for many. While watching this, one can almost feel that everyone involved had an absolute blast making this movie. PS. This time Tarantino's toe-fetish comes in the shape of the camera lingering on the digits peeping from a plaster cast of the double-agent assisting the Bastreds, actress Bridgett von Hammersmark (who got injured in a fantastic bar-room stand-off scene).